Homeland Security Secretary Kirstjen Nielsen doubled down on a claim that Middle Easterners are among those traveling in the Central American caravans currently making their way north in hopes of gaining asylum in the United States. Speaking with Fox News Intelligence on Monday, Nielsen said: "We absolutely see people from the Middle East, from southeast Asia, from other parts of the world," adding "They are not just from Central America." "We don’t always know exactly who they are ... What I can tell you is we stopped 3,000 people last year at the southwest border who had patterns of travel similar to a terrorist. We call those special interest aliens." Nielsen also added that the migrants are using women and children as "barriers," which are sent up to the front of the group to frustrate federal military and police, and that the rest of the caravans - which appear to be organized and financed - are comprised of "mostly single men." She added that the timing and origin of the groups are suspicious in nature. Nielsen's comments come amid a CNBC report suggesting that President Trump's decision to send thousands of US troops to reinforce border security in California, Arizona and Texas will cost upwards of $220 million. Last week footage emerged of several groups of migrants becoming violent with Mexican authorities, including this clip of them throwing rocks at a helicopter. President Trump in response said that the US military would treat rocks as "rifles," a comment he later walked back while still stressing that the caravan was a dangerous threat to the United States. 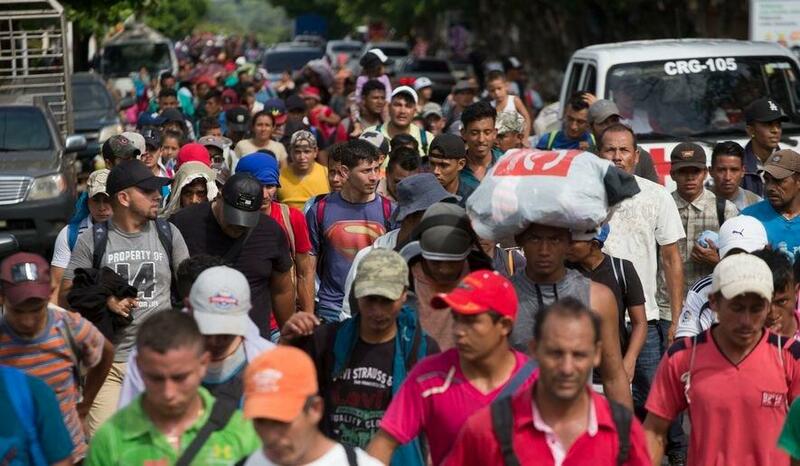 Meanwhile, according to Mexico News Daily, a fourth caravan of 4,000 asylum-seekers is now making its way north, bringing the total number of migrants headed towards the US above 12,000. The first caravan started out with approximately 7,000 people, however around half either turned back or accepted asylum from Mexico. Between 7,000 and 15,000 US troops will be stationed in Southern Border states, while the actual number of migrants which reach the US-Mexico border will undoubtedly be much smaller than the estimated 12,000 currently traveling north. An April caravan of approximately 1,200 people dwindled to several hundred people, who were granted asylum at the US border.